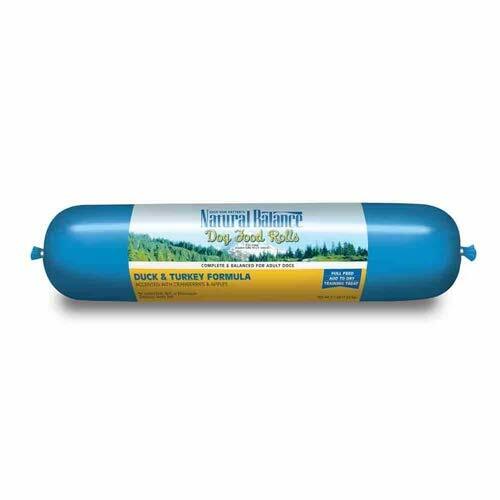 Natural Balance Rolls are made with the freshest quality meats and grains, resulting in a nutritionally complete meal rich in vitamins and minerals. Natural Balance contains approximately 40% less water than canned food which means one 4 pound roll is equivalent to twelve 13.5 ounce cans. It's made in the USA from USDA inspected meat, with no corn or soy. It contains kelp and lecithin. Use as a full feed, mix with dry food, or give as a delicious treat. Pet Botanics created a revolutionary grain-free version of their highly palatable rolled food. The first ingredient is premium lamb meat followed by vitamin-rich ingredients and omega fatty acids to promote healthy skin and coat health. Lastly they added their exclusive blend of botanical extracts called BotaniFits. This mixture of eight natural extracts includes green tea, yucca schidigera and rosemary; all long-accepted to naturally support digestive health in animals. Their grain-free rolls are made using a patented process that enhances the flavor and maintains the nutritional value of the ingredients.